Today I attended one of the most terrible shows I’ve ever seen. 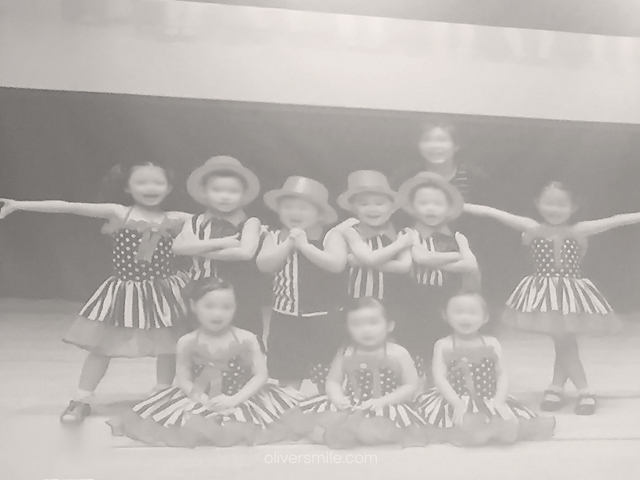 It was my 4 year old, Oliver’s, year end performance. Everything that can go wrong, went wrong. The sound system was screechy whenever the volume’s turned up higher a notch. A little boy got frightened by the small crowd and bolted off stage, bursting into tears when coaxed to return. He was carried away without performing. More than a handful forgot the steps and one simply stood on stage, holding his cardboard oar and staring at us strangely like Han Hui Hui demanding her CPF money. At the end of a particular cheery song, two little boys were fighting. Cringeworthy graduating speeches were recited, one girl drowning out the rest with her showy enunciation. The ribbons that decorated the auditorium fell off one by one as the show progressed. A few babies cried. Eager parents held their phones to record or photograph their kids instead of clapping along. My son was adorned in blue and pink eye shadow that resembled an SIA girl from the 70s. He was a bossy little one, instructing his peers where to stand, shaking and prancing energetically on stage. And I was the annoying parent, waving enthusiastically to him as he waves back in the midst of his song and dance. It was all terrible. So terrible that it’s perfect. This was the exact cliches I’ve read about, heard about, before I got a family of my own. This was raw vitality, packed in a room less than an acre long. It’s tiny little lives, experiencing their first important moments. Moments that will never come by again. That little boy with stage fright might overcome it next year. Blank stares would be replaced by assuredness and knowledge, missed steps transiting into something more structured. Today, I attended one of the most terrible shows I’ve ever seen. It’s an awful mess of chaos, but I love every moment of it. I hooted and cheered, whilst my son abandoned his dance steps to wave back at me. I wonder 10 years down the road, will he show the same enthusiasm? Or think that his mom is trying to embarrass him? And life, is a beautiful mess.